There’s a box of old cassette tapes in my basement. At least I hope it’s in my basement. These aren’t commercially produced music tapes. Not mix tapes. Many of them are recycled from old episodes of the Pat Boone Show (which we used to air on Saturdays on WLIX in Long Island) and have handwritten labels that include a date or some sort of key word. These tapes, and I’m really hoping they are actually somewhere in my basement, are old aircheck tapes. Airchecks are recordings of radio air shifts without the music, just the talk. The last time I saw the alleged box was probably shortly after I moved into my current residence some 16 years ago. Some of those tapes are going on 40 years old and they represent the only audio record of my storied career in radio. At the moment I’m actually really hoping there’s one tape in particular in that box. 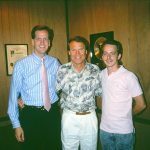 It would be from October 1991 and would be labeled “Glen Campbell.” I had the opportunity to spend a day during that October with that legendary singer and I recorded a good deal of our conversation. In 1991 Glen released a decidedly Christian album, “Show Me Your Way.” Of the 10 songs on that project there were four or five that got a great deal of attention from Christian radio. And it was that attention that provided me with the opportunity to meet Glen Campbell. In all Glen released over 70 albums (according to his official website) sold over 50 million records and had more than 80 charting singles. He won six Grammy Awards and many other honors from the Country Music Association, the Academy of Country Music and the Gospel Music Association. 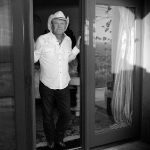 His music managed to cross the gap between country and pop with several of his songs charting in both formats. Campbell did battle with alcohol and cocaine abuse and was married four times. He credited his fourth wife, Kim, with helping him kick his addictions and returning to his faith. It was this faith that fortified Glen through his early stages of a battle with Alzheimer’s. He was diagnosed in 2011. Through the ensuing years Kim would update the public on Glen’s condition and continued to state that their faith in Jesus was helping them through the difficult time. On that afternoon back in October 1991 Glen was extremely open, transparent and warm. My general manager, Lloyd Parker, and I took a limo from the station, WLIX, on Long Island to Manhattan to pick Glen up at his hotel and take him back to the studio. I spent several hours with him in our production room. I really hope I can find that tape in my basement. 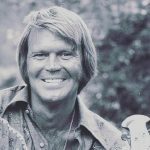 I’d love to hear Glen Campbell’s voice again. 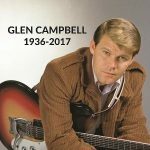 Glen’s final album, “Adios,” was released on June 9, 2017, just two months before Glen passed. Here’s the video version of the title song. 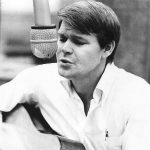 “Wichita Lineman,” released in 1968 was a major breath through for Glen. Here he is performing it on his TV show. Here’s Glen doing “By The Time I Get To Phoenix,” originally released in 1967. Glen performs the 1967 “Gentle On My Mind” with a full orchestra.